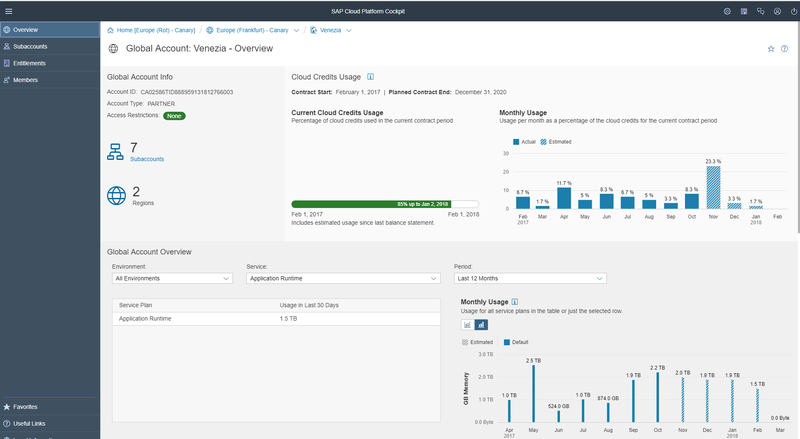 By now, you would have heard or read about the new consumption based commercial model for SAP Cloud Platform. If not, then you can take a look here to get yourself acquainted with it. For the questions that this brings to your mind, you can bookmark this FAQs wiki. Now for the practical part of it. How can one manage and monitor the services in the Global Account under this model? This post will explain this part. Let’s begin with the structure of the Global Account under this model. 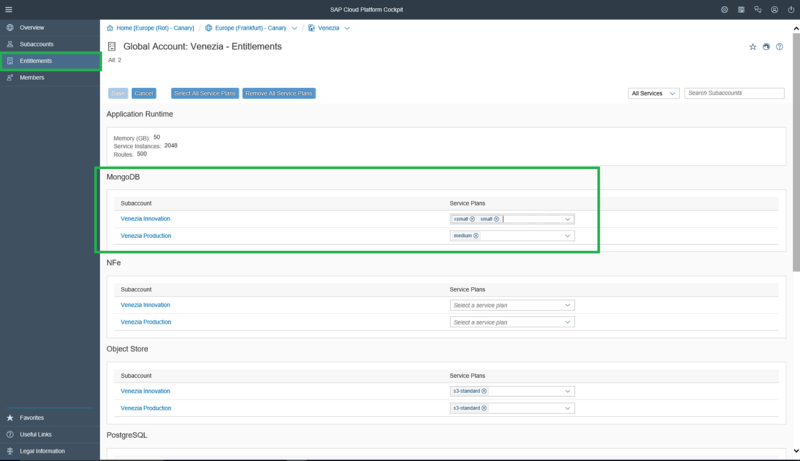 As a customer, once you sign the CPEA (Cloud Platform Enterprise Agreement) the nominated Cloud Administrator user from your organization will get access to the Global Account. Please note that the Global Account associated with the CPEA contract will look a little different from the Global Account associated with the Subscriptions contract. Coming back to the topic, the administrator can start configuring the landscape once he logs in to this Global Account. The Cloud Administrator would begin by creating the subaccounts and additionally orgs and spaces in the Cloud Foundry environment. She would then assign the users to the respective subaccounts/orgs/spaces. Now comes the interesting part – the Cloud Administrator would have the capability to make entitlements for each subaccount as to which services and which service plans (e.g. Small, Medium, Large) would be allowed for that subaccount. Without taking care of this step, the users of those subaccounts cannot instantiate the services. Once the above 3 steps are completed, the other users can log in to the Global Account and start working. I will show the entitlement and instantiation capabilities in the following screenshots. The entitlement process is essentially a control mechanism provided to the administrator, to prevent the exhaustion of the cloud credits accidentally by one or two people in the team who might not know the impact. As one would expect, there is no charging at the time of entitlement itself. The charging begins only when someone instantiates/activates the services. In the Cloud Foundry environment, you would see the “Entitlements” section in the menu on the left hand side. Click on that and choose the service plans for each service that you want to entitle the subaccounts for. In the Neo environment also, you would see the menu option on the left hand side and proceed in the same way as explained above. 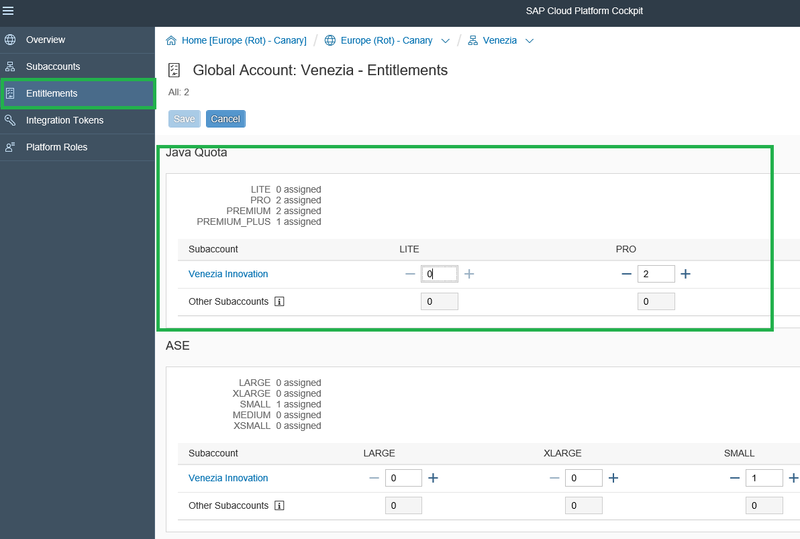 Here you can assign the entitlements for the data and storage items – viz. 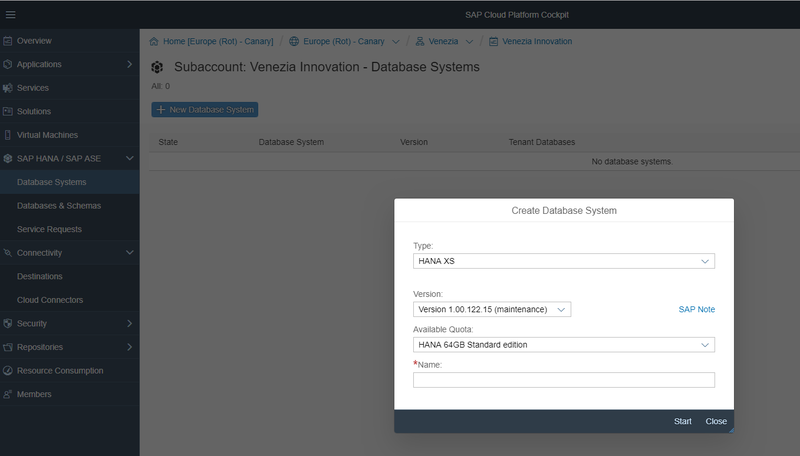 SAP HANA, ASE and Java Quota. The additional feature here is that you can also specify the maximum number of instances for each plan that can be instantiated/activated per sub-account. Once the developers have been assigned to a subaccount, they can login to the Cloud Platform cockpit and start instantiating the services. They will be able to instantiate only those services (and the corresponding service plans) which the administrator has assigned to the subaccount. The developers can instantiate/activate the services also from the command line interface. Here I will show how to do that from the web UI. This is a very small subset of what all can be done in the cockpit. For more details, please refer to the help documentation. The administrator will be able to see the burndown of the Cloud Credits against the consumption of the services, from an Overview page in the Global Account at any time he/she wants. The Overview will show the history and current state of services that are running in each sub-account in each environment (Neo/Cloud Foundry). It will also show what is the impact per month on the consumption of the Cloud Credits that were purchased, so that the administrator can then plan the budget, and inform the organization, for the next months accordingly. For a detailed documentation about the onboarding into the Global Account for the Consumption Based commercial model, please follow this link. Hope the post was useful for you. Keep an eye on the blogs for more updates in the coming days. Please provide your feedback via comments about this post, as well as about what other topics would you like more information on.